"You see, in this world there's two kinds of people, my friend: those with loaded guns and those who dig. You dig." Blondie (Clint Eastwood), talking to Tuco (Eli Wallach). After the success of A Fistful of Dollars and For A Few Dollars More, Sergio Leone finally gets his hands on the budget of his dreams, and assembles the first western opera to conclude the Dollars trilogy. Driven by an Ennio Morricone music score featuring the two-note coyote yell that has since become legend, and with every scene a lesson in framing, actor dynamics and fluid camera motion, The Good, The Bad, and The Ugly is an all-time classic. It's a sprawling epic about three men chasing after buried gold coins in the midst of the American Civil War. Tuco (Eli Wallach, as the Ugly) is a common bandit with a bounty on his head; Blondie (Clint Eastwood, as the Good, although the term is only relative) is a bounty hunter; and Angeleyes (Lee Van Cleef, as the Bad) is a brutal henchman who is singlemindedly pursuing the buried loot. The three men wage a triangular battle against an unforgiving desert landscape littered with desperate, colourful and disposable secondary characters fully aware that they are bit players in a masterpiece of storytelling. Tuco and Blondie start out as partners but their relationship quickly deteriorates. They are soon engaged in a deadly personal feud when they stumble onto the clues needed to locate the treasure that Angeleyes is after. Angeleyes is mercilessly abusing or mowing down anyone who gets in the way of the treasure that he craves. The three men, after taking turns to brutalize each other, need to make their way to the cemetery where the gold awaits, while guarding against each other in a deadly game of shifting alliances, with the added inconvenience of avoiding the brutality of the Civil War raging around them. 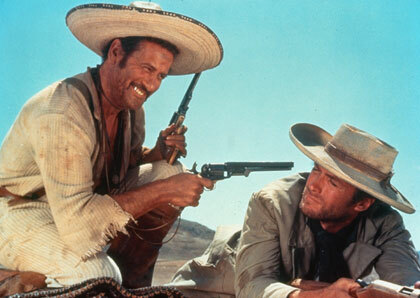 Leone could now afford a third American actor, and Eli Wallach gives the performance of his life as Tuco. While Eastwood and Van Cleef nail their stoic and tough personas, Wallach takes over the heart of the film as the scrambly, shifty bandit scratching out a form of survival. He is also afforded the only back-story in the movie in a sequence where he meets his brother. Tuco's subsequent description of his relationship with his brother as he rides away with Blondie is the most human moment in the entire trilogy. The film has two enormous, drawn-out showcase scenes, and both come in the final hour of this 160 minute epic. In the first, Tuco and Blondie stumble upon a stand-off at a bridge between the Union and Confederate armies, and need to resolve the meat-grinding battle that is hindering their progress towards the gold. The second showcase occupies the final 30 minutes, and takes place at the cemetery. When Tuco arrives at the cemetery to start his search for the all-important grave, Leone conjures up one of the best scenes in the history of movie-making. 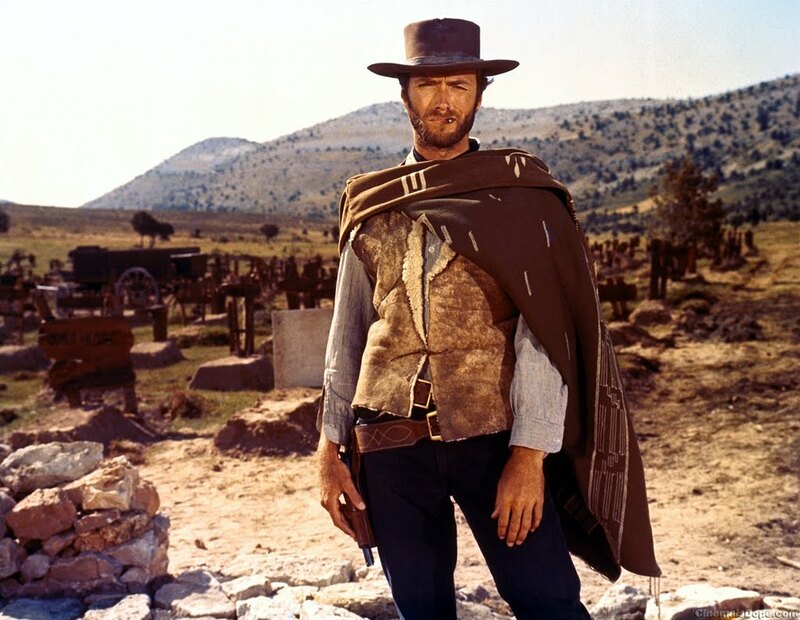 As Ennio Morricone unspools the magnificent The Ecstasy of Gold theme, Leone's cameras alternate their focus between Tuco sprinting through the cemetery and the whirling multitudes of headstones. The end-result is spine-tingling, hypnotizing and brilliant, all at once. Leone follows this with the classic triangular showdown between the three men in the middle of the cemetery, unimaginably stretched in time and filled with Leone's trademark tight close-ups. The Good, The Bad and the Ugly is a breath-taking conclusion to a magnificent trilogy, and also one of the best films ever made.